I began playing the guitar at 15 years of age being influenced by the style of rock music. Hours of practice later I began to be inspired by song writing in many forms, from movie scores, instrumental music, vocal compositions in many different styles. I was a member of a progressive rock band by the name of Vaudexville that began to have some success across the globe in that style of music. This was the band that influenced me to compose record and release my own music. To further expand my Musical Education became important to me, so I went on to study and complete a diploma in jazz performance and then a bachelor of music. During this time, I also released a few albums under the 'Deluc' name, also with a band called Arctic Band, which was a pop/rock release, a band named Mico which was an adult contemporary release, I also composed a film score release, that I named Manigra. After years of playing the guitar I was also inspired to play the bass guitar, keyboards, a little bit of the kit and recently in the last 2 years the alto saxophone. Through performing, composing and recording music I decided to share my experience and knowledge and began to teach our young generation the passion of music. I have toured various countries such as China and its surrounding areas, Vietnam and all over Australia with many different bands. In the future, I plan to continue to release music that is real and honest that people will hopefully embrace. 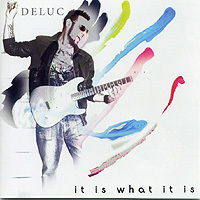 The latest Deluc release is titled It Is What It Is. It was recorded during the first half of 2010 and released in the same year. I recorded all the tracks in my own studio, then took it and did final mixes at a studio by the name of 'Hot House'. In the past I have used a number of musicians, but on this release I wanted to express myself in other ways, so I ended up playing the guitars, bass, keys, alto sax parts and getting in a great musician and friend of mine Paul Cengia to play drums. I also incorporated my family, my wife Kate on Vocals and daughter Jett did some spoken word. The art work was also created by Jett, my 4 year old daughter. The idea behind this release was to create perform music with no inhibitions, to just make music for the love of making music. If it sounded good, then it was good. I didnt care about industry expectations, but I did care about freedom in the music. The title was also a factor in this release. When recording the parts for the release I wanted purity, whatever happened at the time is what I kept. To keep it real and raw was my aim. When doing this CD I was in a complete free state of mind, the music was initially for myself to express what was happening in my head and soul. On this release I recorded most parts with a Fender Strat, at times I brought in a 7 string Ibanez for the crunchy rhythm parts. I used a combination of setups from a Fender Amp and Line 6 Pod XT into an Avalon pre-amp, also a few pedals Ibanez Tube Screamer etc... I also used a Takemine Santa Fe Nylon String for some rhythm parts. Through my music education that I believe never stops some great influences on my playing and song writing were musicians like Steve Vai, Joe Satriani, Scott Henderson from Tribal Tech, Yes, Rush, Dream Theater, Fates Warning, Charlie Parker, Prince, Maceo Parker, Frank Gambale, Sting, thats just to name a few. There are so many styles of music and amazing artists that contribute to the world of music and this I search to be influenced and inspired. Some great releases that play a big part in my listening catalogue would be Vai's Passion And Warfare, the production Jesus Christ Superstar, Sting - Soul Cages and really all his albums, Miles Davis - Kind of Blue. The main plan is to get the music out to the globe, get as many people listening to the music and hopefully enjoying the work/performances. Within Australia it is very difficult to perform live, as there is not large a scene for this music, but hopefully I can take the tour abroad and play some shows in the USA, Europe and again different parts of Asia. I am working on new material for the next release and experimenting with a few ideas, maybe mixing a heavier sound with a little more alto sax and maybe running that into a few effects, let's see what the vibe creates.